September.. one of my favorite months! I'm actually excited that it's over though because now it's like officially Fall. There is literally nothing better than cooler weather, Fall clothes, leaves falling everywhere, Fall and Halloween decor.. yeaaaaah baby. I don't wanna waste any time chatting (I have a podcast for that), let's get into my faves! This is pretty random, but this has been my morning coffee combo this past month. Like I've said before.. I am a seasonal trend follower. Once September rolls around I go from wearing bright colors to dark vampy colors, and from iced coffee to hot coffee. I love Cafe Bustelo because it's super strong and gives me the kick I need in the morning and mixed with the Italian Sweet Cream creamer, ugh, it just tastes like a cup of COZY. This is my official drink of the season. 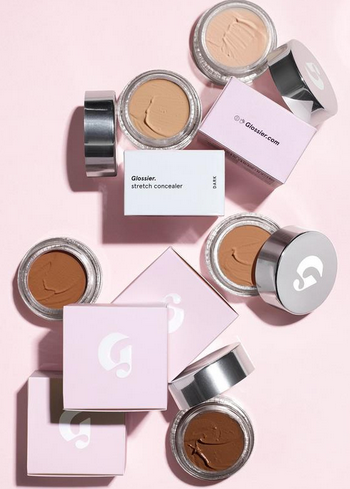 I've really been getting into Glossier products lately (just like everyone else on Instagram). I recently ordered one of the Phase 2 sets which comes with the stretch concealer, boy brow, and their Generation G lipstick. I actually like all of the products but this concealer kinda stole the show. I really love how lightweight this is. I use this pretty much every morning because it's so easy to work with. I just twirl my finger around in it, tap it under my eyes and blend it with a Real Techniques contour brush. If you're into that dewy look, this is definitely the product for you. I always throw a powder on after to kinda matteify since I'm prettyyyy oily to begin with. This is officially a new part of my everyday routine. I've definitely mentioned this on my blog/instagram/podcast before because it's really just my favorite color ever created! I love wearing this, all year long.. doesn't matter the season. It looks good on short nails, long nails, oval nails, coffin nails.. ERRTHANG! Clearly, I'm pretty passionate about this nail polish so you can imagine how sad I was when my nail lady told me it was being discontinued! Luckily my amazing, knowledgeable, and lovely cousin let me know that Essie Peak Show is pretty much the same color. What a gem, amirightttt?! Unfortunately, both polishes are sold out (told you it was an iconic color). Sorry! These have been a LIFE SAVER! I can really, really see the difference in my skin after using these. I swipe the pad across my entire face after cleansing then continue the rest of my skin care routine. These really help with pimples that have already made their way to the surface but also helps with those terrible ones under the skin that kill and even helps with dark spots left over from previous pimples. They're a staple in my skincare routine now and I'm excited to try some other Clearasil products. I actually just watched this show last weekend which was technically October but I could NOT wait a whole month to share this with you. This mini-series covers how terribly Kalief Browder was failed by the justice system. He was arrested at 16 years old and sent to Riker's Island where he waited 3 years to go to trial for a crime he didn't commit, 2 of those 3 years he spent in solitary confinement. I hope you guys enjoyed this post and check out some of the things mentioned. Let me know what some of your favorite products of the month were! Until next time..